No front-load dryer, modern or conventional, is totally quiet during a typical drying cycle. Often you hear the clanging of metal fasteners on clothes hitting against the drum and thumping as laundry tumbles dry. But if your front-load dryer is making an out-of-the-ordinary whining sound; the noise may suggest a problem. You won't know for sure whether the whining noise is fairly routine or problematic until you do a basic inspection of your dryer. A broken component related to the drum can cause a front-load dryer to whine. Certain front-load dryers have a rear drum bearing, which is a type of support joint. The component helps the drum maintain a steady position as it turns. The bearing sits in a bed of grease that permits it to revolve with the drum. Over time, the grease can dry and cause the bearing to whine each time the drum moves. Lubricate the bearing to alleviate the whining sound. Rollers are small, usually metal or plastic, wheels that are attached to the outside of the drum on a front-load dryer and support the drum's movement. If a roller fails, the component may make a whining or squealing noise that's frequently heard consistently throughout a drying cyle. Contact a dryer repair technician to inspect the dryer's rollers for faults. Replace the entire set of rollers if the technician determines that a roller has worn. Gliders are typically found on the edge of a front-load dryer's drum. They're plastic or rubber shields that support the drum and ensure that it makes smooth movements. Gliders can wear with excess dryer use, which is usually evident from the whining noise they sometimes produce as they begin to rub against the cabinet. Eventually, bad gliders can also cause the drum to dip in the back and create a crevice for clothes to become trapped. Replacement gliders are commonly are sold in a pair. Change both of the old gliders for new ones to eliminate the whining noise. 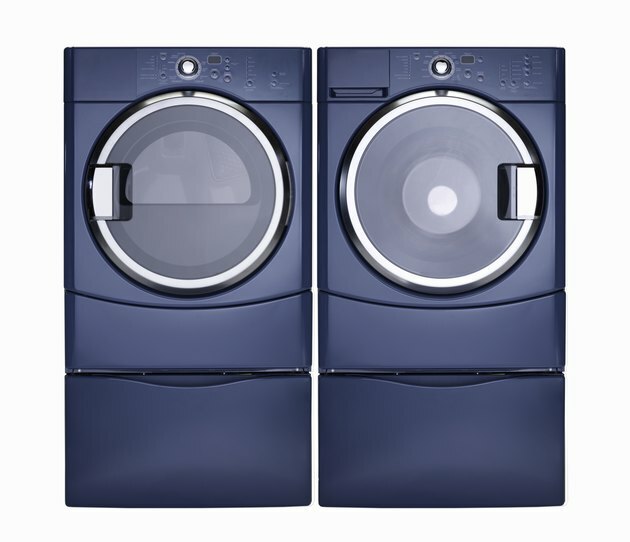 If this is the first time you've heard your front-load dryer whine, the noise may be because the dryer is unbalanced. Verify that an object didn't get caught beneath the dryer, which could make it uneven, and remove the object if one exists. Try to shift the dryer from side-to-side with your hands. If the dryer moves, adjust its leveling feet at the bottom corners to stabilize it. Consult the manual that came with your dryer for leveling instructions, if needed. Once the dryer is level, the whining should subside.